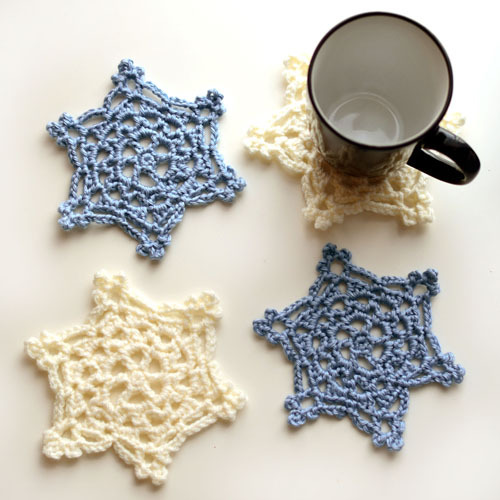 Add a touch of winter to your home decor with these snowflake coasters. They are super quick to crochet, you’ll have an entire set made up in no time. Use them yourself or give them as a gift. You can also get creative and string them together to create a garland instead, or attach a hook and use them as Christmas tree ornaments. The pattern is crocheted in the round from the center out. It’s balanced with just the right amount of lacy and solid to create the perfect coaster or whatever you want to use them for! This entry was posted on Monday, November 27th, 2017 at 12:00 AM by Rachel Choi	and is filed under Best Crochet Patterns. You can follow any responses to this entry through the RSS 2.0 feed. You can skip to the end and leave a response. Pinging is currently not allowed. The stars are very pretty and these colours look good together.